The effective medical management of any of the above events requires rapid and accurate triage. Immediate (Red tag): The victim needs immediate medical care and will not survive if not treated quickly. (for example, a major hemorrhagic wound/internal bleeding) Top priority for treatment. Here’s our hypothetical scenario: you are in your village near the border with another (hostile) group. You hear an explosion. You are the first one to arrive at the scene, and you are alone. There are about twenty people down, and there is blood everywhere. What do you do? In our last article, we discussed the 5 “S’s” of initial MCI scene evaluation. From that, let’s say that you have already determined the SAFETY of the current situation and SIZED UP the scene. There appears to have been a bomb that exploded. There are no hostiles nearby, as far as you can tell, and there is no evidence of incoming ordinance. Therefore, you believe that you and other responders are not in danger. The injuries are significant (there are body parts) and the victims are all in an area no more than, say, 30 yards. The incident occurred on a main thoroughfare in the village, so there are ways in and ways out. You have SENT a call for help on your handie-talkie and described the scene, and have received replies from several group members, including a former ICU nurse who is contacting everyone else with medical experience. The area is relatively open, so you can SET UP different areas for different triage categories. Now you can START (Simple Triage And Rapid Treatment). You’re lucky, 13 of the 20, mostly from the periphery of the blast, sit up, or at least try to. 10 can stand, and 8 go to the area you designated. These people have cuts and scrapes, and a couple are limping; one has obviously broken an arm. 2 beaten-up but sturdy individuals join you. By communicating, you have made your job as temporary Incident Commander easier by identifying the walking wounded (Green) and getting some immediate help. You still have 10 victims down. You then go to the closest victim on the ground. Start right where you are and go to the next nearest victim in turn. In this way, you will triage faster and more effectively than trying to figure out who needs help the most from a distance or going in a haphazard pattern. Let’s cheat just a little and say that you happen to have SMART tags in your pack. 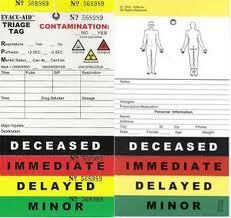 SMART tags are handy tickets which allow you to make a particular triage level on a patient. Once you identify a victim’s triage level, you remove a portion of the end of the tag until you reach the appropriate color and place it around the patient’s wrist. You could, instead, use colored adhesive tape, colored markers, or numbers (Priority 1 is immediate/red, 2 is delayed/yellow, 3 is minimal/green, 4 is dead/expectant/black; this is used in some other countries and is useful if you’re color blind). Respirations: Is your patient breathing? If not, tilt the head back or, if you have them, insert an oral airway (Note: in a MCI triage situation, the rule against moving the neck of an injured person before ruling out cervical spine injury is, for the time being, suspended) If you have an open airway and no breathing, that victim is tagged black. If the victim breathes once an airway is restored or is breathing more than 30 times a minute, tag red. If the victim is breathing normally, move to perfusion. Perfusion: Perfusion is an evaluation of how normal the blood flow or circulation is. Check for a radial pulse and/or press on the nail bed (I sometimes use the pad of a finger) firmly and quickly remove. It will go from white to pink in less than 2 seconds in a normal individual. This is referred to as the Capillary Refill Time (CRT). If no radial pulse or it takes longer than 2 seconds for nail bed color to return to pink, tag red. If a pulse is present and CRT is normal, move to mental status. Mental Status: Can the victim follow simple commands (“open your eyes”, “what’s your name”)? 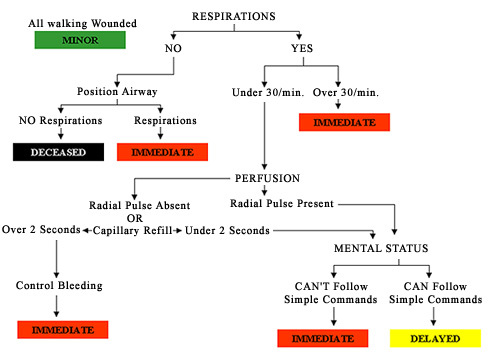 If the patient is breathing <30/minute and has normal perfusion but is unconscious or can’t follow your commands, tag red. If your breathing, normally perfused victim can follow commands, tag yellow if they can’t get up or green if they can. Remember that, as a consequence of the explosion, some victims may not be able to hear you well. If there is any doubt as to the category, always tag the highest priority triage level. Not sure between yellow and red? Tag red. Once you have identified someone as triage level red, tag them and move immediately to the next patient unless you have major bleeding to stop. Any one RPM check that results in a red result tags the victim as red. For example, if someone wasn’t breathing but began breathing once you repositioned the airway, tag red, stop further evaluation if not hemorrhaging and move to the next patient. Elevate the legs if you suspect shock. 1. Male in his 30s, complains of pain in his left leg (obviously fractured), Respirations 24, pulse strong, CRT 1 second, no excessive bleeding. 2. Female in her 50s, bleeding from nose, ears, and mouth. Trying to sit up but can’t, respirations 20, pulse present, CRT 1 second, not responding to your commands. 4. Another teenage girl, small laceration on forehead, says she can’t move her legs. Respirations 20, pulse strong, CRT 1 second. 5. Male in his 20s, head wound, respirations absent. Airway repositioned, still no breathing. 6. Male in his 40s, burns on face, chest, and arms. Respirations 22, pulse 100, CRT 1.5 seconds, follows commands. 7. Teenage boy, multiple cuts and abrasions but not hemorrhaging, says he can’t breathe, respirations 34, radial pulse present, CRT 2.5 seconds. 8. Female in her 20s, burns on neck and face, respirations 22, pulse present, CRT 1 second, asks to get up and can walk, although with a limp. 9. Elderly woman, bleeding profusely from an amputated right arm (level of forearm), respirations 36, pulse on left wrist absent, CRT 3 seconds, unresponsive. 10. Male child, multiple penetrating injuries, respirations absent. Airway repositioned, starts breathing. Radial pulse absent, CRT 2 seconds, unresponsive. Next article, we’ll see how we used START to sort our victims, utilized our unskilled help, and proceeded once we completed primary triage. 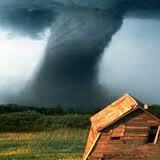 We’ll also discuss how our evaluations would stand up in a SHTF scenario.